St Stephen’s College’s admin has reportedly denied the alleged vandalization in college campus even as Delhi Police dismissed the charges as ‘rumours’. 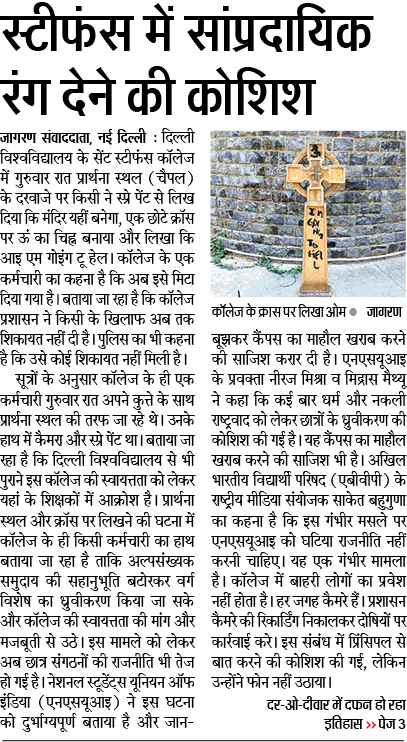 As per reports, a cross outside the chapel, on the grave of college founder Samuel Scott Allnut and the door were ‘vandalized’ by ‘Om’ and ‘Mandir Yahi Banayenge’. Apparently, student union president Sai Aashirwad spotted the writing on Friday. However, as per Indian Express, college bursar Renish Abraham, who is officiating in absence of the principal, denied such an incident. He said that he did not see anything written on the chapel door and even denied reports that the college had filed a complaint in this regard. Report in Dainik Jagran say a different picture. The report says that sources said they saw a college employee go towards the chapel with their dog, camera and spray paints. There have been earlier reports that a lot of teachers have been protesting against the proposal of making St Stephen’s College an autonomous body. The sources have reportedly said that the alleged vandalization was carried out by college employee.